Perfect for medical students, junior doctors, anaesthetic nurses and allied health professionals, Lecture Notes Clinical Anaesthesia provides a thorough introduction to the modern principles and practices of clinical anaesthesia. Full-colour diagrams, photographs and key fact boxes support easy understanding of the theory of anaesthetics allowing confident transfer of information into clinical practice. 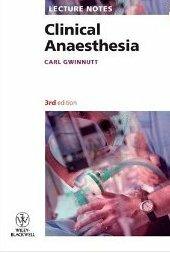 This fourth edition has been fully revised and updated to reflect recent developments within the anaesthetics specialty and is fully supported by a wide-range of self-assessments for study and revision purposes together with a range of 'tips for anaesthesia attachments' that start each chapter. Whether you need to develop your knowledge for clinical practice, or refresh that knowledge in the run-up to examinations, Lecture Notes Clinical Anaesthesia will help foster a systematic approach to the clinical situation for all medical students and hospital doctors.